"Lately, distance running has succumbed to the allure of impossibly fast times set by a quick-flowing stream of anonymous, interchangeable, sponsor-wrapped blades, slicing seconds off the world record. Times are faster, but who cares? Two hours and three minutes is not inherently interesting - people are. ..."
"... Unlike the smooth and outwardly impassive professional runners, Kawauchi grimaces, and his arms flail. He appears to be struggling, yet he hangs on, often collapsing at the finish. Even so, he insists marathon running is 'fun.' ... JAAF named Kawauchi to its marathon team for the world championships, to be contested Aug. 17 in Moscow. The cameras will undoubtedly focus on the lead pack of uniformly knife-thin gazelles. But further back, spectators - perhaps a government worker with a desk job, maybe a middle-of-the-pack college runner or a gangly high school student with big dreams - will strain to see a spiky-haired, muscular striver, teeth bared, giving it everything he has." - Excerpt from Slate.com article by Sarah Barker on Japan civil servant runner Yuki Kawauchi, who has a 2:08 PR and beats many of the professional corporate Japan runners despite working a full-time job and keeping up a ridiculous racing schedule which has included 4 marathons, 2 half marathons, a 30k and a track 5k in 2013 alone. Nick Symmonds "I will be prepared to run 3:32, 3:33 if I can get into the Monaco 1500." Impressive depth: US is almost on par with Kenya in top 100 ranked athletes for mid-distance/distance track events!!! *More Post-USAs: UCF Sophomore Octavious Freeman Going Pro After Finishing Runner-Up In The 100 At US Champs As She Signs With Icon Management According to this article, a part of the reason she'll be passing up her remaining 2 years of eligibility is UCF coach Caryl Smith Gilbert is leaving for the University of Southern California. *Coach John Drummond Thinks A Healthy Tyson Gay Can Win Championships Even Against Bolt Drummond: "You're now seeing the Tyson of 2007. You're seeing a mature, focused, committed guy who's been through a lot of issues and (injuries), one after the other. It can be heartbreaking, but he stayed the course and stayed focus. The end result is what we see right now." 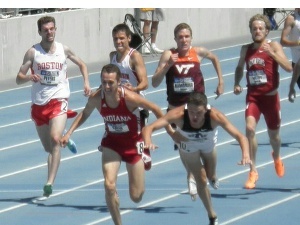 *USTFCCCA Looks At 2013 Collegians' Performances At USAs An unexpected highlight had to be Ryan Hill making it in the 5k. Spanish Distance Runners Arrested In Drug Bust Getting Caught With Anabolic Steroids, EPO And HGH Three of the four include former national 10,000m champion Ricardo Serrano and Álvaro Lozano. Brit MD Runner Lynsey Sharp Admits Doping In The Sport Among Her Rivals Almost Made Her Quit She finished 2nd in Euro 800, but was upgraded to 1st after Russia's Yelena Arzhakova tested positive. Sharp: "It definitely crossed my mind a couple of times - what's the point in doing this if that's what I'm up against? But I've worked so hard, I've been in the sport since I was eight and I'm not going to give up because somebody else is doing something they shouldn't be doing. It's encouraging that I was able to compete against people like that." New adidas Shoe Features Plastic Springs They supposedly are designed to increase energy return and propel a runner forward. LRC Men's 5,000: Bernard Lagat Outkicks Galen Rupp To Win The Men's 1,500m 5,000m The men's 5,000m was extremely slow for a high school race until the final mile when it became very fast. It was set up perfectly for the 38-year-old former miler Bernard Lagat, who is healthy and with his speed in 2013, and national champion once again. NC State's Ryan Hill was the big surprise in 3rd. Recap/analysis/results/interviews. OTB: A Hypothetical: What IF Lagat Is 27 And Galen Is 38? LRC Women's 5,000: Jenny Simpson Gets The Win In Her First 5k In Two Years Over American Record Holder Molly Huddle, As Rowbury Guts It Out for 3rd Jenny Simpson was the 1,500m World Champion in 2011, but we don't think she's ever been running better as a pro at this time of year, than she is now as she won the 5,000m title over American record holder Molly Huddle. Miler Shannon Rowbury appeared cooked with 300m to go but had a furious final 200m to get 3rd. Is Will Leer kicking himself for not running the 5000m? Leading, pushing the pace and winning - Simpson, 800 winners, Jager - Just today. Leading's often good. Gay Steps on Line in Semi and Not DQd? Wisco Coach Mick Byrne on USATF Not Filling 5000m Field: "Someone in USA Track and Field is not doing their job, it's that simple." Saturday Sprints/Field: Brianna Rollins Breaks Gail Devers' American Record, Lolo Jones Goes Home As 3 Women's American Records Set Rollins was just .05 off the world record. Michelle Carter broke the American record in the shot put and Amanda Bingson got the hammer on Day 3. Illness Keeps New Pro Kori Carter Out Of Hurdles Semis Ato Boldon said she was a gold medal threat. Kenyan Champs: Geoffrey Mutai Wins 10,000m At Kenyan Champs, May Run It At Worlds IAAF It was also announced Abel Kirui and Wilson Kipsang will not run the Worlds marathon. The Kenyan Champs are separate from the Kenyan Trials next month for Worlds. US Half Champs: Mo Trafeh Over Meb Keflezighi, Adriana Nelson Over Desi Davila Meb and Desi continue to take positive steps coming back from injury. $12,000 for the winners. More on Nelson's first USA title here. Lolo Jones Runs 12.50 Stadium Record In Semis, Brianna Rollins Runs Wind-Aided 12.33 She also talks about the half empty stadium. Lemaitre: "It's about my speed, not my skin colour." Ritz: "I really believed I was going to win the race ..." He talks about getting faster, being better than Rupp and Farah at the longer stuff and the sub-27 bucket list. Jordan Hasay Joins Nike Oregon Project Al Sal will be coaching her. 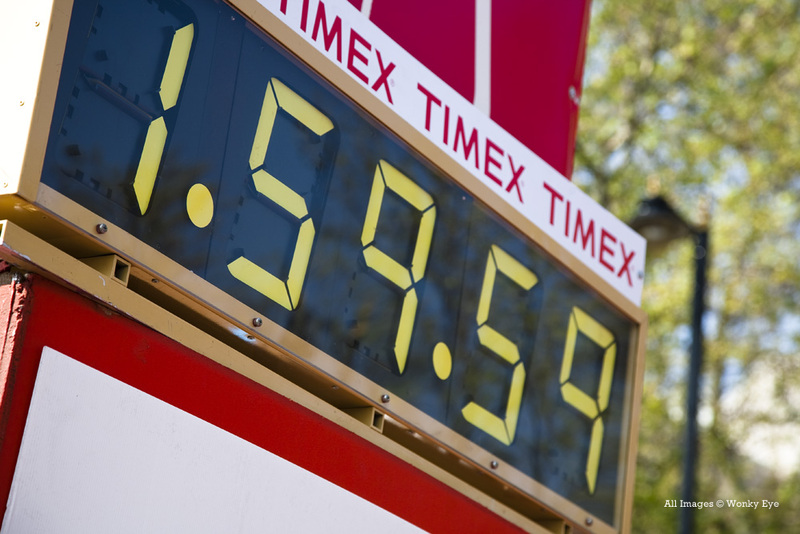 LRC Women's 1,500: Does Mary Cain Make It To Moscow? What About Past Champions Uceny, Rowbury Or Moser? Picking the first two is easy. The question is who wins, and who gets third? LRC Women's Steeplechase Preview: With Defending Champ Emma Coburn Out, Moscow Spots Are There For The Taking Picking the first two is easy. The question is who wins, and who gets third? *Star Tribune: Minnesota Steeplechaser Jamie Cheever Aims For Spot In World Championships With Coburn injured, Cheever has the top seed after her big 22-second PR (9:29) at Stanford earlier this year. LRC Women's 800 Preview: Montaño, Martinez And Then Who? Picking the first two is easy. The question is who wins, and who gets third? Thursday: IAAF Ostrava Golden Spike Preview: Kenenisa Bekele Will Try To Go Sub-13 In The 5k While Tirunesh Dibaba Is In The 10,000 Mohamed Aman is in the 800 (David Rudisha pulled out as he's still dealing with the injury that held him out of Pre), Bahrain's former 2-time World champ Maryam Jamal is in the 1,500 and Milcah Chemos (she'll face Russia's former Olympic champ Gulnara Galkina) and Conseslus Kipruto highlight the steeples. Kirani James is in the 400, Asafa Powell in the 100 and Yelena Isinbayeva and Renaud Lavillenie vs. Bjorn Otto highlights the PVs. *Sally Pearson Says She's Healthy And Read To Run Fast This Year After Coming Back From Her Second Hamstring Tear She'll race in Ostrava against GB's Tiffany Porter and the Birmingham DL meet against Dawn Harper and Kellie Wells on Sunday. She's apparently feeling confident in her fitness as she talked about defending her Worlds title and getting close to the 12.21 WR this year. Sunday: Stacked 5k Highlights Fields Which Include 30 Olympic Medalists At Birmingham DL: Mo Farah Faces Hagos Gebrhiwet, Yenew Alamirew & 2011 World 10k Champ Ibrahim Jelian Other action includes Shelly-Ann Fraser-Pryce vs. Carmelita Jeter in the 100, Christine Oburuogu vs. Amantle Montsho in the 400, Felix Sanchez, Michael Tinsley, Javier Culson and Dai Greene in the 400H, Greg Rutherford vs. Dwight Phillips in the LJ, Robbie Grabarz vs. Mutaz Essa Barshim and Jesse Williams in the HJ and Aries Merritt in the 110H. Monday: Duane Solomon Making A 600m WR Attempt At The Jerome Classic In Canada On Monday The current WR is held by his coach, Johnny Gray (1992 Olympic bronze winner and US 800m record holder) at 1:12.21. Solomon's PR is 1:15.70, which he set January indoors. July 17th: Jordan Hasay And Tara Erdmann Will Make Their Male-Paced 10k Standard Attempt In Portland The IAAF "A" is 31:45 and the "B" is 32:05. If they both get the "A" or if one gets the "A" and the other the "B," both will make the team. Recommended Read: Marathon Everyman: Yuki Kawauchi is a world-class athlete, a full-time government clerk, and a Japanese national hero. Could he change the way we think about running? "Unlike the smooth and outwardly impassive professional runners, Kawauchi grimaces, and his arms flail. He appears to be struggling, yet he hangs on, often collapsing at the finish. Even so, he insists marathon running is 'fun.'" Geoffrey Mutai Feeling Fit And Wants To Be On Kenya's Worlds Team For Moscow After Running A 27:55 10k At Their National Championships He says if he's not selected for the marathon squad, he'll run the 10k at their trials since he wants "to be remembered for what I did for my country." 2-Time Olympic 100m Champion Shelly-Ann Fraser-Pryce Embracing The 2013 After Winning It At The Jamaican Trials She says running the 200 this year has made her better in the 100 and her coach thinks she'll go sub-22 eventually. MileSplit World Youth Trials Coverage Courtney Corrin won the LJ with 20-11. Former 100 WR Holder, Check Fraudster And Heroine Dealer Tim Montgomery Is Out Of Prison And Has Booming Speed Academy Business NUMA Speed Never Underestimate My Ability has grown by word of mouth to 60 clients, including baseball and football players. Unbelievable: Javelin Thrower Riley Dolezal Went Into USA Seeded #14 With 74.22m PR, Left With 83.50 PR And USA Victory Even better, he hit the IAAF "A" standard to the centimeter. If You Can't Develop Sprinters, Just Get Them To Switch Countries: 2012 World Jr. Champ (20.27) Delano Williams Switches Allegiance To GB, Will Run Worlds In 2013 His native Turks and Caicos Islands isn't recognized by the IOC. He trains in Jamaica with Bolt. Bolt Tweets Encouragement To Asafa: "Don't give up bro.. Keep the [email protected],"
LRC Mens 800: Duane Solomon Goes Wire-To-Wire To Run World-Leading 1:43.27 To Stop Nick Symmonds' Streak Of US Titles At Five Solomon, Symmonds and Brandon Johnson all delivered on the big stage as the US has great medal prospects in this event. After, Symmonds talked about his streak ending and trying to do the 800/1,500 double in 2016. More: Oregonian *Register-Guard: "Nick Symmonds' 800-meter reign runs its course." OTB: Anyone else happy Solomon took down Symmonds? LRC Women's 800: Alysia Montano Wins Her 5th Straight National Title, Holding Off A Fast-Closing Brenda Martinez Martinez made Montano work every single step of the way for US title #5 in a row as World Junior Champion Ajee Wilson went sub-2:00 for the first time to make the Worlds team. LRC Steeple Evan Jager And Dan Huling Go 1-2 In Steeple For Team Schumacher De'Sean Turner was 3rd as the training partners Jager and Huling were too good over the final 800. Sunday Men: Tyson Gay's World-Leading 19.74 Caps Final Day As Aries Merritt Makes Hurdles Team Tyson Gay is the world leader at 100m and 200m now. World record holder Merritt made the team after coming back from injury. As he said in this post-race interview, he only did two hurdle workouts before this meet. *MB: Gay Steps on Line in Semi and Not DQd? Sunday Women: Kimberly Duncan Upsets Allyson Felix In 200m At USAs Jenn Suhr won and so did Jenny Simpson and Alysia Montano. We hope you know that from our LRC recaps. Boston: Stephen Sambu, Mamitu Daska Win 2013 BAA 10k Former Providence star Kim Smith ran 33:34 and she's still on track to win $100,000 showing this is the easiest $100k in the sport. Sambu's on track for the $100k as well. Jamaica: Warren Weir Runs 19.79 To Win Jamaican Champs In case you missed it, Bolt won the 100 on Friday. Weir's celebration at the finish is getting some attention. It was nothing crazy. LRC Mary Cain's Going To Worlds: Treniere Moser Just Edges High School Star Mary Cain link updated 17-year-old Cain nearly won the race, but was passed by training partner Treniere Moser in the final meters. Shannon Rowbury and Morgan Uceny both failed to make Worlds. More Cain: SI's Tim Layden On 17-Year-Old Mary Cain Booking Moscow Trip And 21-Year-Old Brianna Rollins Crushing Gail Devers' American Record Cain had veins of ice on the track but the pressure started to get to Cain between the prelims and finals off the track as she called her mom and cried and then called coach Alberto Salazar Saturday morning freaking out. LRC Medal Threats Centro And Leo Go One-Two link updated Matt Centrowitz held off Leo Manzano, and Lopez Lomong was third as an emotional Andrew Wheating was DFL. Recap, analysis, and post-race reaction/video. LRC Four Years After Breaking Her Foot At World Trials, Nicole Bush Goes Wire-To-Wire In Steeple Ashley Higginson got 2nd for Coach Gags, and Shalaya Kipp picked the perfect time to have her best race of the year for 3rd. Bridget Franek struggled the last lap in the heat. How does Manzano do it? Why was the women's 1500m so slow? Matt Elliot just missed World's by .2 Lamong is lucky!!! LRC Women's 800: Alysia Montaño And Brenda Martinez Still Look Good; Maggie Vessey And Phoebe Wright Go Out Brenda Martinez showing some Joe Vigil strength with a negative-split sub-2:00 800m. LRC 2013 USATF Men's Steeple Prelims, Jager, Leslie, Huling Impress Jager talked about the rest of his 2013 season, which will include only a steeple at Worlds. *RRW: Working Together, Brannon Kidder And Cas Loxsom Enjoy 800m Success Both went out today in the 800 semis. 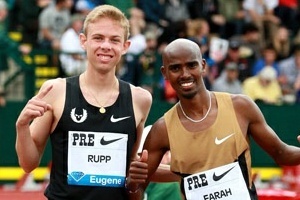 LRC Men's 5,000 Preview: Galen Rupp, Bernard Lagat And Then Who? Lopez Lomong would appear to be the guy - assuming doubling back from the 1,500 isn't a problem. 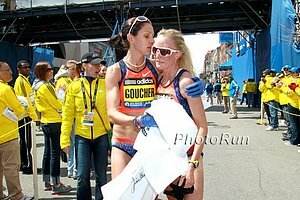 LRC Women's 5,000 Preview: Last Year's Race Was Truly Epic; Let's Hope for An Encore Shalane Flanagan, Jenny Barringer and Molly Huddle. It doesn't get better than that. LRC Non-Distance Surprises In The 400s: Sanya Richards-Ross In, Jeremy Wariner, Nellum Out On a positive note, 2012 Olympic champ Sanya Richards-Ross seems to finally be on the comeback trail from injury as she won her heat. Rupp, Derrick, Ritz or True - Which One Goes Home Devastated? Just yesterday I thought Jordan Hasay should retire and now here she is today making her first Olympic team.